Cheese Pairing: Brie de Meaux with crusty baguette, fresh strawberries and Champagne. A reader wrote in recently with a list of about 30 cheese pairings asking for my feedback. I thought it would be really great to open up the discussion to all you readers out there. So every week I will post another one of her pairing suggestions, with my thoughts. Please leave a comment and let everyone know what you think! This week's pairing is Brie de Meaux with crusty baguette, fresh strawberries and Champagne. 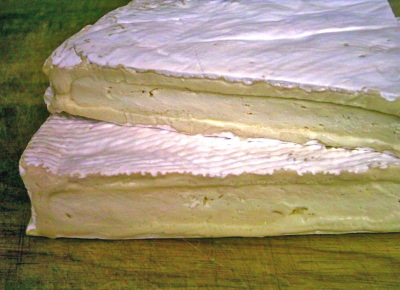 Brie de Meaux is an A.O.C. cheese made from cow's milk in the town of Meaux, near Paris. It is mushroomy and creamy, with an unctuous paste and a delicate bloomy rind. Champagne is a good choice; the tartness of the wine balances well the creaminess of the cheese. However, a bold Cabernet Sauvignon or Merlot might be a better match for the savoriness inherent in the cheese. Like Champagne, Strawberries should provide a sweet counterpoint to the savoriness of the cheese. As for the crusty baguette, it is a great vehicle for enjoying this smooth, sensual cheese. (Incidentally who would ever want to eat a non-crusty baguette?) What do you think, o faithful readers? This week the Amateur Gourmet has a great video up that chronicles a recent visit he made to Murray's Cheese. In it he learns about the main differences between cow, goat, and sheep's milk cheeses, about what distinguishes real British farmstead Cheddar from others, and about one of the best French blue cheeses available stateside, Persillé de Malzieu. Nathan, the cheesemonger featured in the video, has helped me on a number of occasions lately, and is a really great, friendly, knowledgeable guy. 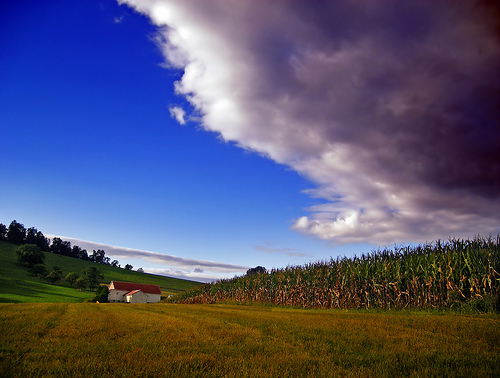 So You Want to Work on a Farm? Dairy farming and small-scale processing are some of the hardest jobs you can take on. They require physical and emotional strength, perseverance, patience, flexibility, good observational skills, love of and respect for animals and ability to maintain routines. You may be required to stay up all night, get up in the dark or otherwise interrupt your sleep to check on animals or cheese. You may have to work outdoors in all kinds of weather, you might get really dirty or even splattered with manure. If you work at a creamery you may be required to interact with the public. For some reason, people do it anyway. The benefits and rewards of dairy farming keep many people going in spite of the hardships. For those of you in the Northeast U.S. who are interested in supporting the local wine and cheese industries, the Pennsylvania-based Berks County Wine Trail is hosting an Artisan Wine and Cheese Pairing fundraiser on October 13th and 14th. Ticket-holders will be able to sample, at each winery’s tasting room, a broad spectrum of the award-winning wines that hallmark Berks County’s wine community; plus, experience first hand, locally made cheese -- crafted by area cheesemakers. I like to troll the Internets for interesting looking cheese classes, and two in particular jumped out at me recently. This fall, Artisanal and Murray's are both offering intensive educational experiences that cater to the serious enthusiast (a.k.a. curd nerd) and to the food professional. Murray's class, called Cheese U, is an intenstive six-week course designed to give attendees a well-rounded education in all things cheese. The class starts with an introduction and orientation, and continues with a detailed look at the different types of milk used to make cheese, the history and geography of this great food, followed by a look at cheesemaking, affinage (the art of aging cheese) and beverage pairing. 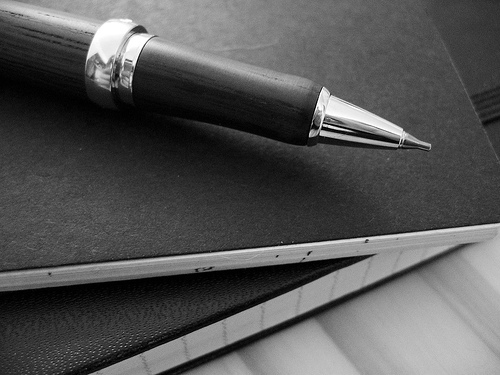 The course is pricey at $795, but in addition to the classes themselves you get a "required reading list," take home assignments, a final exam and a Certificate of Achievement upon completion. Artisanal's Master Class: Intensive Class for Professionals is largely geared towards food professionals (and comes with a correspondingly high price tag at $1200), but promises to spend a full 2 1/2 days covering "the entire world of cheese, from milk types to cheesemaking, affinage to appreciation, placing an emphasis on service, selection, and proper care of cheeses for the foodservice professional." With instructors like Max McCalman and Daphne Zepos, this class should prove to be truly enlightening. 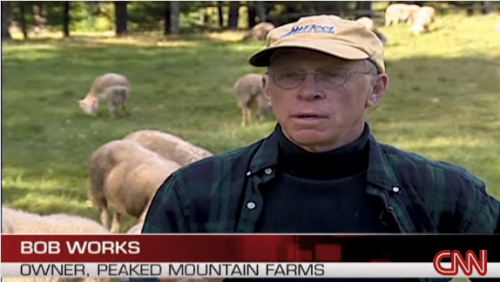 Today on CNN.com there's a short but interesting video piece about retired real estate agent Bob Works and the sheep farm he runs, Peaked Mountain Farms. 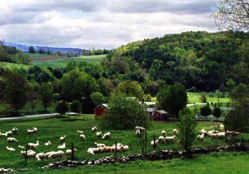 Peaked Mountain Farms is in Townsend, VT, and is one of the farms that makes Vermont Shepherd cheese. It's old hat to see blogs by cheese mongers, or other dairy heads, but I have yet to see many blogs from cheese makers themselves. After all, making cheese is so time-consuming, what cheese maker in his or her right mind would choose to spend the little free time they had on blogging? Well there are a couple of new blogs to report on that signal perhaps a new trend, both are from cheese makers who are in the trenches working hard to make the cheeses you and I love to eat. The first is from LittleFfarm Dairy, a start-up artisan goat cheese maker in South West Wales, UK. Their blog is a daily journal, tracking their progress as they start the business with a herd of pedigree British Toggenburg goats. I don't know how these folks have the time to raise goats, make cheese, AND blog, but I'm glad they do, because the blog really adds a personal dimension to their operation that you don't get with too many other dairies. Rosh Hashanah, the Jewish New Year, starts Wednesday night this week. Many Jewish holidays have associations with certain foods, and on Rosh Hashanah it is typical to see honey consumed in many different ways, all in celebration of the coming a sweet new year. And in my opinion, the best way to eat honey is alongside some creamy, curdy ricotta cheese. Below is a great, seasonal recipe from the September 2005 issue of Gourmet Magazine that features honey, ricotta, and pears. And please, do yourself a favor and get some really rich ricotta, like this sheep's milk version made by Dancing Ewe Farm. In one of the hottest trends in dairy right now, companies in Europe and the U.S. are moving to create innovative products that contain added probiotic cultures, microorganisms thought to confer health benefits when ingested in adequate amounts. In January 2006, Dannon introduced Activia, a yogurt supplemented with live Bifidus Regularis bacteria, to the American market. And with each passing month it seems more and more companies are hopping on the probiotic bandwagon; Italian cheesemaker Bidino recently announced a new line of cheeses containing probiotic cultures.